Risks are everywhere in our personal and business worlds and they are inherent or residual, yet we cannot operate as we do without them. 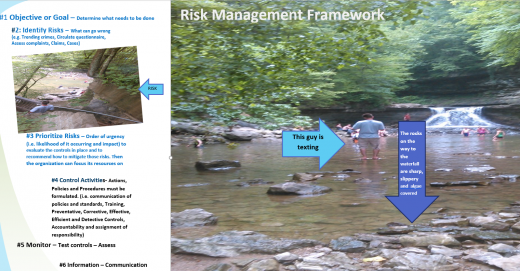 There are also so many risk management frameworks, assessments based on each industry. This is a general platform with IT base to get things started. The types of risk events that could occur are endless and thus having an effective risk management plan that is assessed annually (at minimum) is what allows for the success of an organization – no matter how small. The reality is that the more prepared and organized an organization is for events the faster the recovery and some industries are required by certain regulatory authority agencies to have a risk management plan as part of their Compliance programs.